Tesla anti-gravity coil Scale: A ruler in the foreground shows the base to be only 3 1/2 inches wide. I am an associate producer for History Detectives, a series on PBS. 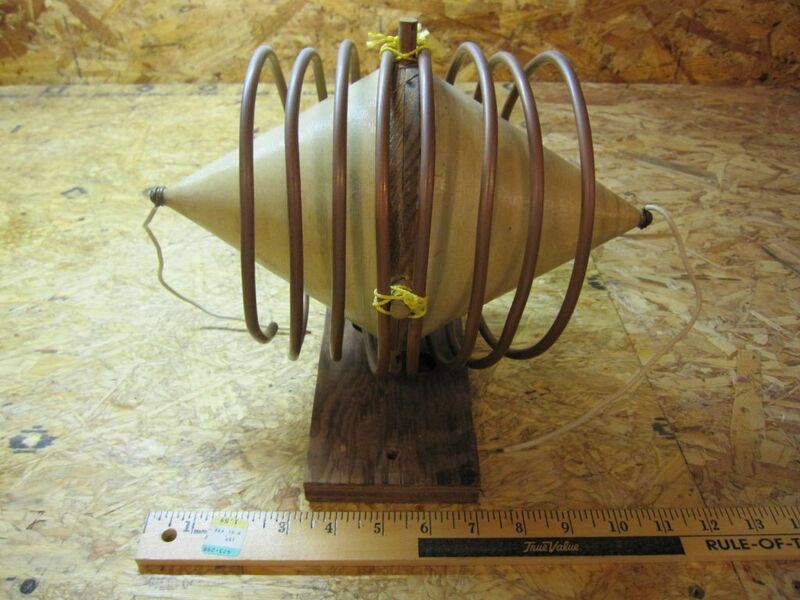 I am hoping you can help me with some research I am doing on the attached cone and coil, which our contributor purchased under the assumption that it was part of Nikola Tesla’s antigravity experiments. I am in the initial phases of research and have no idea what I am looking at. Do you know anything about Tesla’s equipment or experiments? Do you have a guess about the purpose of this object? Does it have anything to do with energy? The contributor also mentioned that this was purchased from the estate of an FBI agent; materials from Tesla’s experiments that were confiscated and supposedly never seen again. This is a move up, I thought. The last producer to call was from Fear Factor. In my reply, I identified the mystery object as a “conical, bi-polar Tesla coil” I noted that a conical Tesla coil is exhibited at LA’s Griffith Observatory and that a bipolar Tesla coil pulsed 180 degrees out of phase has produced ball lightning. I asked for some details about ithe coil’s physical properties. Tesla patented a bipolar Tesla-coil in 1896 (568,180). A Tesla patent of 1897 (593,128) shows a conical secondary coil. Tesla wrote about anti-gravity in 1900. He patented a VTOL flying machine in 1921. The contributor may have replaced the primary coil, I was told. Privately I wondered if it was customary for FBI agents to take home confiscated artifacts for their personal collections. What other Tesla artifacts might be out there, and will something like this ever surface again? “A Tesla coil is, arguably, an energy magnifier. Hearing nothing for a month or so, and assuming the project had been shelved, I posted this article on teslapress back in March. A month later the producer phones me with a few more questions, says the project is still alive, and that I would be kept informed of its progress. I thought it appropriate to take the article down until the matter was resolved. Six months pass. An e-mail to producer gets no reply, so today (10/21/11) I repost. If you are a TV watcher (I’m not), and happen to see this segment air on History Detectives, or if you have any comments on this article, please e-mail me at tesla@teslapress.com.